Work with COM/OLE/OCX or ActiveX objects in Java apps using a bidirectional Java-COM bridge. ComfyJ allows you to integrate your Java application with any Windows platform COM/OLE/OCX/ActiveX library. The library makes it possible to create Java COM servers purely in Java. In other words, a designed Java COM server can be exposed as COM objects to other COM applications without writing a line of a native code. * This example demonstrates the embedding of Browser component into Java. COM interfaces & data types wrappers allow working with COM types and interfaces like ordinary Java objects. For example, you can use IUnknown, IClassFactory, and IDispatch as typical Java interfaces, and Variant(VARIANT), BStr(BSTR), SafeArray etc. as regular Java types. ComfyJ allows invoking methods of a COM object via its function indexes in VTBL (Virtual Method Table), or by its names using the Automation approach. Also, Automation allows for obtaining and setting properties of a COM object, including indexed and named ones. ComfyJ provides a set of different concurrency models which you can use for initializing COM integration in your Java application. ComfyJ allows you to create a COM object on a remote server. All COM and other native resources will be garbage-collected automatically, or you can release them if required by the application logic. Use any visual COM component (OCX/ActiveX) in Java Swing UI. Using this functionality, you can embed various ActiveX applications, such as Internet Explorer, Acrobat Reader and Microsoft Office, as well as various media components such as Windows MediaPlayer, DVD Player, QuickTime, ShockwaveFlash, etc. Create an embedded object using ProgID, CLSID, or from a document file. Also, you can insert a COM object (which implements IOleObject COM interface) into container. Save and load an embedded OleObject to or from a file in a special binary format. ComfyJ provides a standard COM technique for creating and advising COM event handlers to a COM object. With this bundled application, you can generate Java COM wrappers for COM components or COM Type Libraries. These generated classes allow you to work with COM objects just like regular Java objects. Moreover, this application can compile the generated classes and pack them into a JAR file, if needed. This aspect of ComfyJ allows you to create Java COM servers purely in Java. In other words, a designed Java COM server can be exposed as COM objects to other COM applications without writing a line of a native code. To simplify creation of custom Java COM servers, ComfyJ provides the base classes such as IUnknownServer and IDispatchServer so any custom Java COM objects can inherit these classes, depending on application requirements. Such Java COM servers can implement as many COM interfaces as required—from standard COM interfaces and COM interfaces generated by ComfyJ's Code Generator application, to custom ones. ComfyJ also provides convenient ways for registering created Java COM servers. Such registration can be performed at runtime, i.e., for COM event handlers, or in COM Registry using a bundled ServerManager application. Also, you have the ability to register Java COM servers at runtime without using the ServerManager application. Such registered Java COM servers can be used by other COM applications. To see COM/OLE integration features, Adobe Acrobat Reader version 5.0 or higher is required. 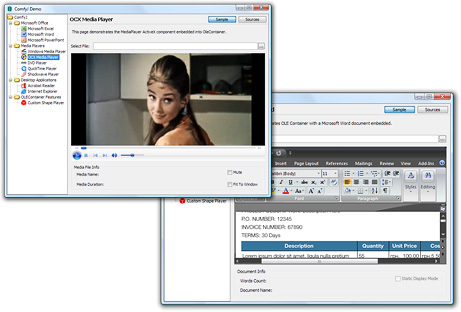 Java applications which embed various system (such as MediaPlayer, InternetExplorer, etc.) and third-party (such as PDF Viewer, Shockwave Flash Player, etc.) ActiveX components directly to Swing UI. ComfyJ provides OleContainer component that allows to embed any ActiveX component into Java Swing UI. Java libraries which integrate with various COM Type Libraries. ComfyJ gives Java applications great flexibility to integrate with any COM Type Library. ComfyJ Code Generator provides the ability to create the Java wrappers for COM types from a COM Type Library. Java applications which expose Java classes to COM. ComfyJ provides ability to create COM classes directly in Java and expose them as Java COM servers so that another COM applications can access them via COM. Is it possible to integrate with a .NET component using ComfyJ? It is possible only if that .NET component is built with enabled COM interop. What does the AutoDelete property of the IUknown interface mean? This property instructs ComfyJ's NativeResourceCollector (NRC) whether to release the COM object automatically or not. By default, this property is set to true for all resources that implement AutoDeleteParameter interface. When this property is set to false, the .release() method should not be called. How to query a required COM interface from a COM object in ComfyJ? Can I use ComfyJ in Java applet? Yes, ComfyJ can be used in Java applets. There are several examples in ComfyJ distribution archive, in its samples\Applets\src\ subfolder, which demonstrate using of ComfyJ in Java applets. Can I release a COM object? Yes, every COM object can be released using its IUnknown#release() method. Make sure to set its AutoDelete property to false before releasing the object. Does ComfyJ provide the ability to embed an ActiveX component to a Java window? Yes, ComfyJ provides OleContainer Java component that allows embedding of any ActiveX component. Where should I put my ComfyJ license files (jniwrap.lic, comfyj.lic)? The simplest way is to package these files to the \META-INF\ subdirectory of an application JAR file. How I can redistribute native JNIWrapper library (jniwrap.dll, jniwrap64.dll, etc.) with my application? The simplest way is to package all required JNIWrapper library files to root folder of an application JAR file. COM should be initialized using ComFunctions.coInitialize() method in each Java thread (except OleMessageLoop) before working with COM objects. Is it possible to expose Java object to COM using ComfyJ? Yes, ComfyJ provides the ability to create Java COM servers and register them in COM. Our licensing is based on versions of ComfyJ. Having purchased the license for our product you get the right to use the current major version of the product. What are the terms for using Comfyj? There are 6 people on our team, and 2 of them need to use ComfyJ. How many licenses do we need to purchase? If we take a developer, working with ComfyJ, off the project, can we reassign the license to another developer? How many copies of my product can I distribute with ComfyJ included? We have 5 people, who work with ComfyJ on one product. Upon the license purchase you will receive an archive with two types of license files: development and runtime. Development licenses are intended to be used in the development process. Runtime licenses are to be used for distribution of your software with ComfyJ enclosed. We need to look at the Source Code of ComfyJ, do you provide it? Yes, you can purchase ComfyJ Source Code License; it is provided on a per developer basis. Please contact our sales team if you are interested in this option. If the message gets lost in your mailbox, try searching for an email from ComfyJ Evaluation Support with “Your Free 30 Days Trial” subject. Take a look at the tutorial to get ComfyJ up and running in no time. See Support Documentation for more information on using ComfyJ. Check out the ready-made examples for instructions and ideas on what you can do with your newly gotten ComfyJ.